Grief and loneliness have been my closest friends for a year, and a change is long overdue. A walk down memory lane in my hometown sounds ideal to start letting go of this never-ending sorrow and try to meet again the carefree, happy girl I once was. But back in Texas, it’s not that girl I meet first. Nate Bowers, president of the Chaos Chasers, is not a saint. He says so himself. As a pragmatic teacher, I should flee from that handsome man as fast as I can. But behind his hard exterior and primitive side, all I see in his brown eyes is a caring, gentle man he shows only to me. And when a past that I didn’t even know was mine tries to harm me, letting me know that Evil can borrow the sweetest face and leave you totally unaware of the danger surrounding you, Nate’s protectiveness has me falling for him. By his side, I live again. With his hands and raw touch, he brings back fire into my body, making me feel like a woman again. With his presence, he shoves the loneliness out of my heart. That’s why when my past literally forces me to choose between my newfound needs and the safety of the man who has found his way into my soul, the choice is torture. But the threat is clear, and the possible sanguinary outcome is too real for me to overlook. So, even if it tears my chest apart to have to leave a family I came to care for despite the hazardous life they live, I need to find the strength to embrace this loneliness I already know will be more painful than it has ever been before. *Book 1 of the Chaos Chasers Series. 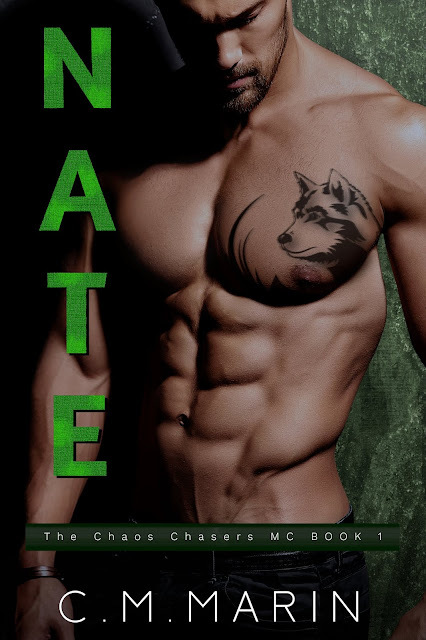 *No extreme violence in this book; NATE is not a dark MC romance. She’s back in town. The only girl to ever hold my heart in her hands is back in town. The news is like the blow from a hammer. It prevents any constructive thoughts from forming in my mind. All I can see is her. All I can think about is how I’ve missed her. All I know is that I have to keep her at arm’s length to protect her. From the threats still coming the club’s way, and from… me. Alex has always had this bright light burning in her beautiful baby blues, and the last thing I need is to smother it with the darkness that settled in mine when every last member of my family was murdered. But the lines I drew back then quickly blur when the Spiders threaten her directly, forcing us to get ready for a possible war. More than ever, I wonder if keeping her close to me, instead of pushing her away, is the right thing to do. Did I make the worst mistake shoving her out of my life? Maybe. But does it really matter now, when she’s so guarded that her heart has most likely irremediably shut down to me?